"Sammy's unreliable mother confesses that she lied about Sammy's age to get her into kindergarten, so Sammy will be turning 13-again! If that's not depressing enough, Sammy discovers that she shares a birthday with her archenemy, Heather Acosta. When she finds a dead cat in a dumpster on her birthday, she's determined to find and stop the cat burglar. Tara Sands has an uncanny ability to slip into the voice of each character, from the teenaged Sammy and her classmates to the gruff Officer Borsch to the elderly Hudson Graham and the psycho Miss Kitty. 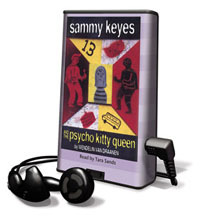 Listeners will cheer Sammy as she outwits Heather and her gang, busts the cat burglar ring, and saves the cats."